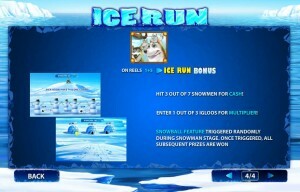 Ice Run is one of the many slot machines which are themed around what happens at the North Pole, but one of the few that actually uses Eskimos as its main characters and tries to show how life is in the areas that they inhabit. The wildlife and marine life of the area is also present on the reels, in a game that doesn’t have direct competitors. Playtech is the developer that created this slot machine. 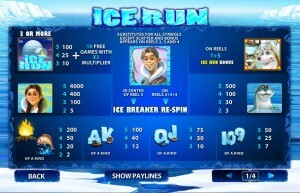 Players that spin Ice Run’s 5 reels will do so by first placing the bet on 1 to 25 paylines. 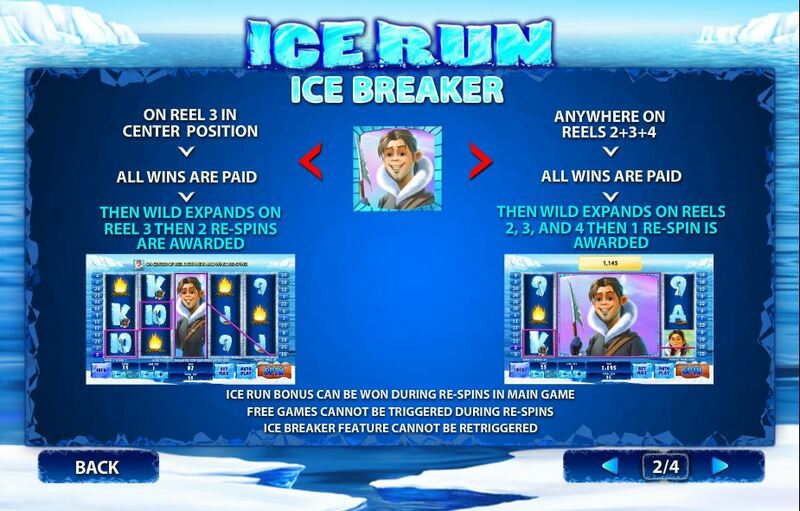 Top rewards of $200,000 are promised inside, with the features bringing in front of you Ice Breaker Re-Spins, free games, bonus games, scatters and wilds. Both new and old features are used together in this slot. 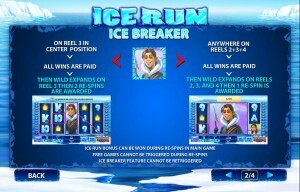 There are scatters which will trigger free spins that have multipliers, plus wilds that can bring Ice Breaker Re-Spins. Bonus games are also used by the slot to make things more interesting. The Eskimo Hunter is shown on three reels in this game. The 2nd, 3rd and 4th reels are the ones that take advantage of its presence, as this is the wild symbol. It can replace a regular symbol, as long as this results in a new combo forming and a win being offered to the player. The wild symbol can be useful in more ways than just as your typical substitute. It also triggers a re-spin feature, when certain conditions are met. If it appears on the 3rd reel, in the position from the center, the wild triggers 2 re-spins, during which the 3rd reel is entirely wild. When the wild is present on all three reels on which it can be, the result is 1 re-spin, with three expanding wilds on those reels. 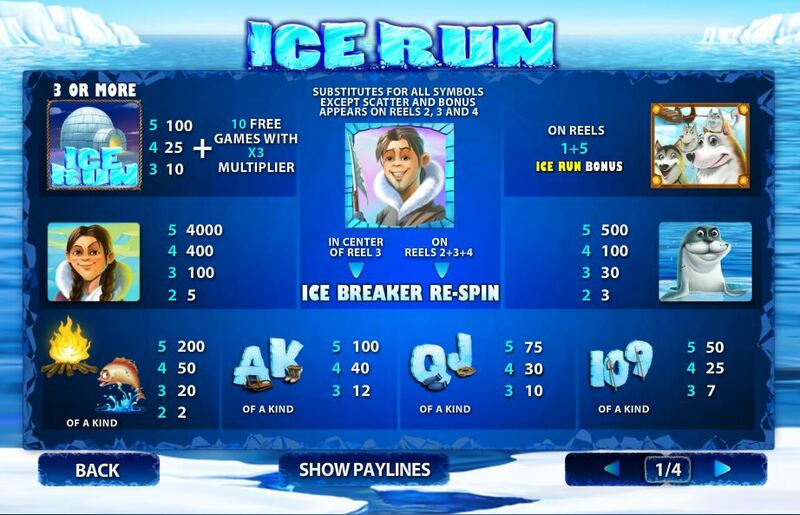 The free spins offered in Ice Run are obtained with the help of scatter symbols which have the Igloo on them. 3+ scattered Igloos will do two things for you. They will offer you a cash prize, between 10x and 100x the bet, and they will start the free spins feature. You get 10 spins for free and tripled wins for the duration of these games. 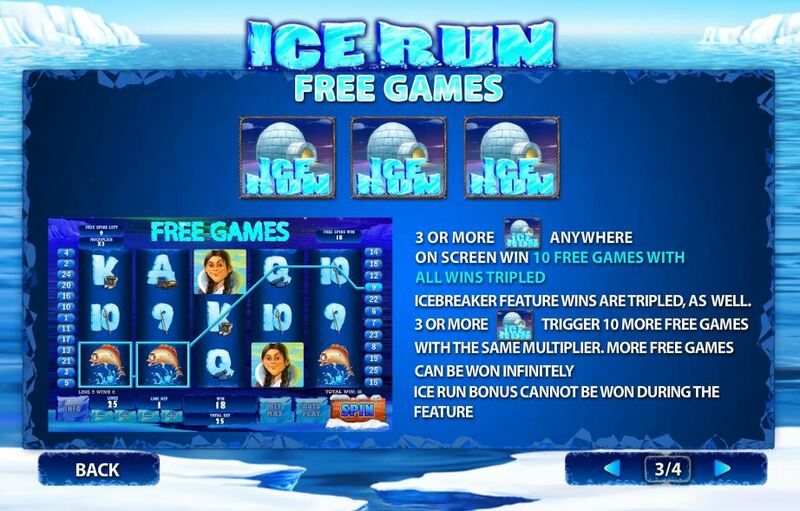 You can retrigger the free spins, provided that you get the same 3+ Igloos again. The Working Dogs symbol is another scatter symbol, but one that triggers a bonus game. When both the first and the last reel have the Working Dogs scattered on them, you get access to Ice Run. The first level asks you to direct your sleigh at three snowmen, out of the seven visible. Next, you enter one of the three igloos visible and you find out what multiplier will be used on the prizes won in the previous level. 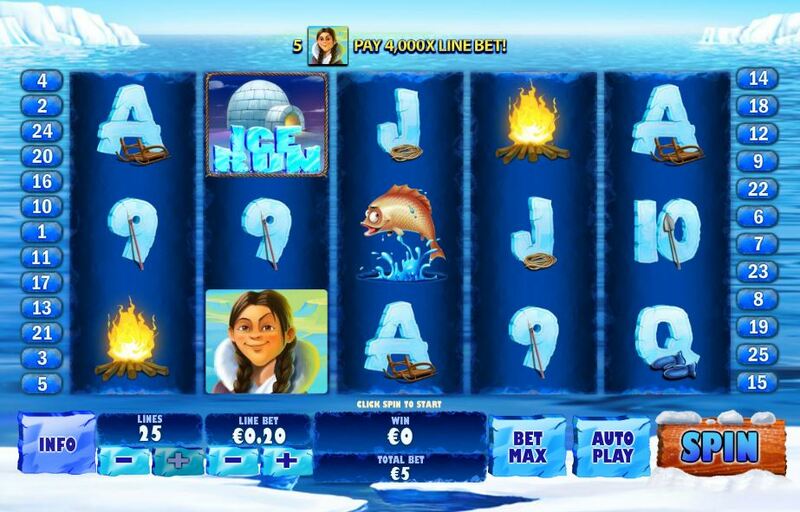 Like most Playtech slots, Ice Run can get expensive in a hurry. You decide the number of active lines, and you also pick the exact line bet for them. The option for the former is for 1 to 25 win lines. For the latter, the value varies between $0.01 and $50. You can bet up to $1,250 on a single spin. 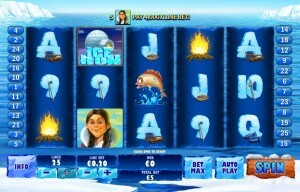 The Girl Eskimo is responsible for the top jackpot being awarded, giving you 4,000 coins ($200,000 or less). The design of Ice Run is done in the style of a cartoon, with loveable characters and animals on its reels. The waters of the North Atlantic ocean are seen behind the game area, with the reels looking like they’re made out of dark blue ice. The playing cards are present in this game as well, all of them made out of ice and having some kind of piece of equipment next to them. It’s a decent design, good enough to allow you to play it until you get bored with the action. Symbols: Eskimo Hunter (wild), Igloo (scatter, 100x the triggering wager), Working Dogs (bonus), Eskimo Girl (4,000 coins), Seal (500 coins), Fire (200 coins), Fish (200 coins), Ace (100 coins), King (100 coins), Queen (75 coins), Jack (75 coins), 10 (50 coins) and 9 (50 coins). While it’s one of the many North Pole themed games, it also has a unique side to it, showing off the Eskimos and their way of life. If you want some interesting features, it has those as well, in the form of Ice Breaker re-spins. 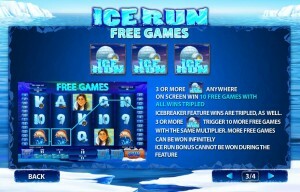 You will find Ice Run at any online casino which chooses to use software from Playtech, playable either for free or for real money.